“Where are you going?” asks the border guard, who looks like a local man, in fluent Hindi. I am sitting in the passenger seat next to the driver. “Lumbini,” I say, somewhat dazed. He peers through the windows and announces to his colleagues, “Only Indians in this car” and in a flash, we are through another gate. Just like that, we have crossed over from India to Nepal and as if on cue, I see a bus with Lumbini Metro City written on it. No visa, no passport — I am a little disappointed at not being able to flaunt the stamp. 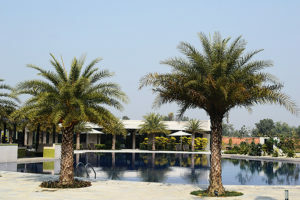 Within minutes we are at Tiger Palace Resort, a five-star property in the middle of nowhere, or so it seems to me. There’s no other building in sight. This is Bhairahawa in district Rupandehi, around 30 minutes from Lumbini. 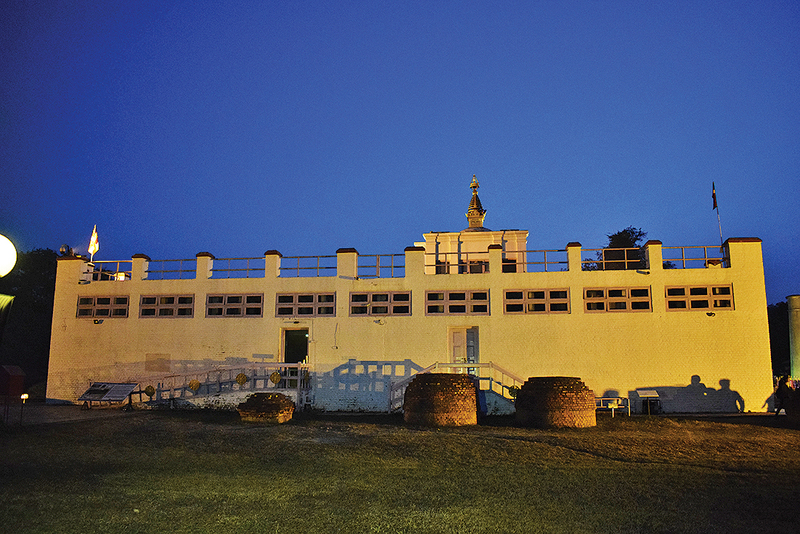 It is also known as the ‘gateway of Lumbini’. No Himalayas here in the Terai region, but plenty of mustard fields. The resort houses a sprawling casino, which is always open. There is a private area for high-stake players. But blackjack, roulette, teen patti are not on my mind. I am in a hurry to go to the spa. 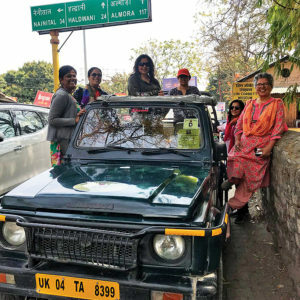 From Delhi to Gorakhpur and then here by road, I need the relaxation and my masseuse Uma works hard on the knots around my shoulder. The chill of the night is broken only by the live music coming from Cabana restaurant. 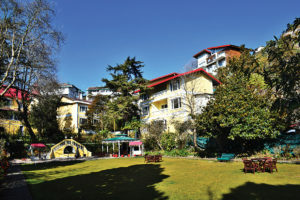 The resort also houses a 100-year-old little temple in its 22 acres, besides an amazing swimming pool, kids’ area and even a movie room. A long barbecue dinner with cocktails and we hit the bed, for the next day has a long list of do’s. We are excited to visit the birthplace of the king who became the Buddha.A signboard says Vipassana meditation centre. A line of flags greets us—these are the flags of the nations whose monasteries are housed here. The area is divided into two monastic zones, says the guide. “See the canal with the boats—that is the division and one can ride in these boats,” he points out. In the eastern monastic zone are Theravadin monasteries. The western zone has Mahayana and Vajrayana monasteries. There is a peace stupa far, far away. Only a white part is visible to the naked eye. Inside the sacred garden is the Mayadevi temple, the guide goes on. In this temple is the spot where the ‘great one’ was born. A stone marks this spot. This was no ordinary birth—Queen Mayadevi gave birth while standing. But before reaching the temple, we gaze upon the lamp of peace which burns all the time, come thunder or storm. The lamp was lit by Prince Gyanendra Bir Bikram Shah Dev on November 1, 1986 to commemorate the International Year of Peace. The flame was brought from United Nations (New York) to spread the message of peace and harmony among the global community. A huge bell with some inscriptions catches my eye. 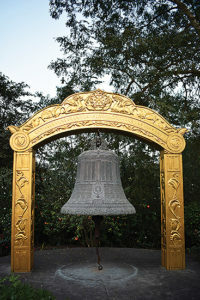 This is the Triratna Peace Bell. An inscription hidden under the trees says, “…this bell invokes the blessings of wisdom and compassion that liberate beings from sarvam dukham and allow peace to flow…” and a lot more. If only the bell would ring, I think to myself. The sun will set and we hurry towards the sacred garden. 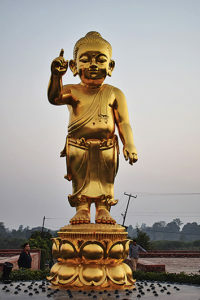 But a shiny gold statue of Baby Buddha stops us. This was gifted by Thailand in 2012, I am told. Walking past boards which announced a bird festival, I see the dates are a week old. The sky is dark. Apparently, this region has a crane sanctuary and plenty of birds. People come for bird watching as well. Taking off our shoes and leaving all sinful objects with the guard, we step in. Another group of devotees from Thailand is also there. Their bowed heads and delicate steps show their reverence. Little lamps in the darkness make the ambience even more eerie. The ruins could perhaps come to life, I think. We huddle near a board as the guide talks about the ruins, sacred Bodhi tree, ancient bathing pond, Ashoka pillar and the temple. We are not allowed to take pictures inside the temple, but in the midst of the ruins we see coins and currency notes. A white stone lies amid a glass case. This is the spot. Right above that is the nativity sculpture showing the birth of Buddha. This was declared a UNESCO World Heritage site in 1997. My hands are dying to take a picture of the birth spot, but there are CCTV cameras and guards. Walking out, a flicker of light catches the eye. Under the sacred Bodhi tree, a lamp is lit and incense burns. The sound of chants travels through the silent night. The group from Thailand is diligently doing its evening prayers near the Ashoka pillar. The guide points out the inscription on it which says, “When King Devanampriya Priyadarsin had been anointed twenty years, he came himself and worshipped (this spot) because the Buddha Shakyamuni was born here. He caused to be made a stone bearing a horse and caused a stone pillar to be set up, (in order to show) that the Blessed One was born here. He made the village of Lummini free of taxes, and paying (only) an eighth share (of the produce).” — The Rummindei Edict, one of the Minor Pillar Edicts of Ashoka. Had we come while the sun was up, we could have seen the World Peace Pagoda, Myanmar Golden Temple and enjoyed a walk in the monastic zone. A peek through the different monasteries would have been pleasing. The human heart is never satisfied and always seeks more, but the spirit knows what it has to do. The chants travelling through the dark night had brought a flicker of hope and turned darkness into ethereal light. And I am glad I was a part of it. 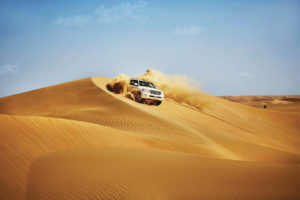 The border town of Sonauli in district Maharajganj, Uttar Pradesh, is an hour’s drive. The railway station is at Nautanwa, a few kilometres away. 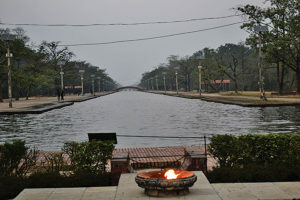 There are flights from Delhi to Gorakhpur, which is a four-hour drive from Lumbini. Indians don’t need a visa to enter Nepal, but must carry a valid photo ID, namely passport, voter ID or Aadhar card. 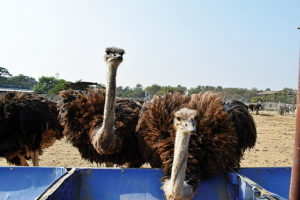 Said to be the only commercial ostrich farm in Nepal, this one houses around 2,500 birds. The farm opened in 2008. 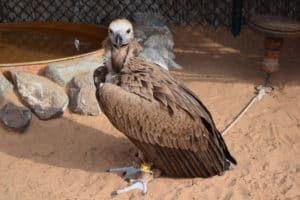 There is a fee to see the long-necked, flightless feathered ones. Strutting in their enclosures, busy with each other, they rush towards their curious visitors. I have seen them snapping off things in documentaries, so I step back a bit. They are fascinated by the camera, but see nothing coming their way to eat. With their long, wavy necks bobbing up and down, they eat the food from the feed bins. There are so many of them and their calls fill the air. Suddenly, one starts running and others run after that one. They stand together for a few minutes and then another curious one eyes us and comes towards the camera. Walking to another enclosure, I see a mating pair. It’s difficult to believe that I am watching the largest bird species up close. Though they can’t fly, they certainly run fast. Going closer, I see some tags around their necks. These are insurance tags, I am told. In a small café, we get to touch an ostrich egg. It feels like plastic but I am assured by the man who runs the place that this is the real thing. People can taste ostrich meat momos and smokey ostrich sekhuwa aka grilled meat.